Each of the five types of boot come in two different styles – what styles these are the MOD have not announced – and in two different widths, so for the first time women can choose a boot that fits them more closely.The new boots were chosen after trials involving 2,000 personnel in Kenya, Cyprus, Canada and the UK. In the pictures supplied by the MOD the Temperate Brown Boots in particular look very much like the hill walking boots you might buy from a brand such as Brasher. Black boots will still be work by ‘non-camouflage’ units, such as much of the Royal Navy and the RAF, and with full dress uniform – eg the Guards Regiments when on ceremonial duties in London. The history of combat boots is actually a pretty interesting one. Of course, soldiers operate on their feet. And on your feet you wear shoes (or boots!). If your boots aren’t good enough, you can’t move. And even in the twenty first century, and army that can’t move on its feet isn’t much good to anyone. For years troops had worn hobnailed boots, or ammunition boots. With the advent of technology, and in particular the growth of outdoor pursuits such as hill walking, more advanced boots gradually became available. Yet, in the Falklands troops actually suffered cases of trench foot, as the DMS boots then in use were completely unsuitable to fighting in cold and wet conditions. One supposes that having fought much of the last 50 years in places like North West Europe, Northern Ireland and potentially against the Warsaw pact, boots designed to fight in extremely hot or extremely cold places were not a priority. The DMS even still had toecaps. Initially there for reinforcement, they were beloved of Sergeant Majors as they were ideal for bulling – that is, polishing to a mirror-like state. British soldiers even took their regular fitness runs in DMS boots for many years, until someone inevitably realised that running long distances in unsuitable boots caused injuries. After the Falklands the MOD introduced BCH – Boots, Combat, High – boots in a very simialkr fashion to those worn by practically every other NATO army for some time. A reliable source once told me all about these famous British Army boots that used to melt in the heat – as seen during exercises in Oman in 2001. I’m not sure about what exactly happened, but it sounds as if the MOD tried to upgrade the boots issued to the forces, but in going for the cheapest option – and potentially buying British – ended up buying a sub-standard product that didn’t do what it needed to do. SA80 mk1, anyone? With the Army fighting two medium-intensity wars in Iraq and Afghanistan, attention has turned once again to finding a style of boot that is comfortable, durable and can work in different climates. At one stage in the Iraq and Afghan deployments it was well known that troops were purchasing their own boots from companies such as Meindl, Lowa or Altberg. Obviously this situation is pretty ridiculous and led to the MOD putting out a tender in 2011, resulting in todays announcement. In terms of most military equipment, I am of a functional mind – first and foremost, get something that does the job, and well. Buying sub-standard usually ends up costing more in the long run. And ceremonial considerations such as what they look like should come a distant second to operational matters. Entries for the Defence IQ Blogging Awards 2012 are now open, so if you write or read a blog which you believe deserves special recognition – get in touch now! To enter a blog, provide the URL, a short description of why the blog is great and what category you want to nominate it in to and email it to samantha.tanner@iqpc.co.uk or let us know on Twitter @DefenceIQ. You can enter as many blogs as you read or write but hurry – nominations close at 14:00 GMT on Wednesday 6th June 2012. The winners will be chosen by the Defence IQ panel and announced on Thursday 14th June 2012. In 1982, the quality of British troops held out when the task force’s land troops came up against the Argentine Army. Much has changed since 1982, both in the British Army and the Argentine Army. Land Forces would play a pivotal part in any future battle for the Falklands, whether it be defending them, or attempting to retake them. If the Falkland Islands were threatened, one would imagine that the first reaction of the British Government would be to reinforce the lone infantry Company at Mount Pleasant. This would probably involve flying in another infantry Battalion via Ascension, and some extra air defence in the form of Rapier and Starstreak of the Royal Artillery. An infantry Battalion is usually on standby as a spearhead Battalion to move anywhere in the world at short notice. There are also a number of other administrative Brigades, that are not geared up towards active deployment. These are the umbrellas for battalions and Regiments not earmarked for deployments, but which could in times of crisis be called upon. In such a manner in 1982, the Scots and Welsh Guards were deployed after finishing a stint of public duties in London, as they happened to be available. As in 1982, we would probably be looking to the spearhead Brigades, ie 16 Air Assault and 3 Commando Brigade to bear the brunt of any operations. 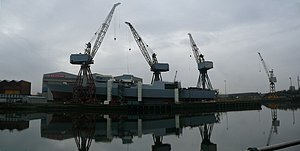 Realistically, with the shipping available, the likely Argentine Garrison to be faced and the troops available, any mission to retake the Falklands would probably consist of two reinforced Brigades, with a similar level of supporting troops – artillery, engineers, etc – as was seen in 1982. The fly in the ointment, at present, would be Afghanistan. Currently light infantry and mechanised Brigades serve 6 month stints in Afghanistan, meaning that Brigades such as 16 AA and 3 Cdo have spent up 6 months of every two years in Helmand. Prior to this, they are training up for the role, and afterwards building themselves up again. Of course, if it really came to it, troops arriving back from Afghanistan could be sent down south a week later, but this would hardly be ideal. In an ideal world, 16 AA and 3 Cdo Brigades would both be available. In the next best case scenario it would be 3 Cdo Brigade plus one of the light infantry Brigades, and the least satisactory scenario would be 16 AA plus a light infantry Brigade. 3 Cdo Brigade, of course, would be invaluable due to their amphibious role. There can be few personnel in the British Army who have not served at least one tour of Afghanistan, and many have probably served more, as well as in Iraq and possibly in Northern Ireland, Kosovo and Bosnia for some older sweats. The British soldier of 2012 is much more experienced and battle-hardened than many of his predecessors, and thanks to some early disasters in Iraq, personnel equipment seems to have seriously improved. In 1982, many troops went down with trench foot thanks to having inferior boots for cold weather. Most weapons systems have been updated – for example the SLR with the SA80, the Bren with the Minimi, and Milan with Javelin. A lot of the new vehicles that have been procured for use in Afghanistan to replace Land Rover are great for that theatre, but would be totally unsuitable to peat bogs in the Falklands. As in 1982, Scimitars and others of the CVR(T) family would be very handy. Ideologically, the British Army is in a strange place compared to 1982. The last ten years have been spent largely fighting counter-insurgency wards against extremist islamic terrorists – firstly in Iraq, and then Afghanistan. To what extent could the Army go from fighting in the sand to fighting in chilly mountain ranges overnight? One suspects so, given the similarity between the Falklands and the Brecon Beacons, for one. Could it summon up the agression for a conventional war, after devoting much of its attention to ‘wars among the people’? I suspect that this wouldn’t be a problem – in 1982 the British Army was geared towards fighting the Russians in North West Europe, and also dealing with terrorists in Northern Ireland, which especially provided very good training for junior leaders. And unlike 1982, most British troops are not already commited to NATO. The Argentine Army abolished conscription after the fall of the military dictatorship in 1983. In 1982, the Argentine Garrison consisted of two strong Brigades, which consisted of 8 Regiments, the equivalent of a British Battalion. The Argentines also had many support troops, in terms of artillery, engineers and armoured cars. But as has often been written, in 1982 the Argentines had to keep their best troops in South America to guard against a possible Chilean attack. 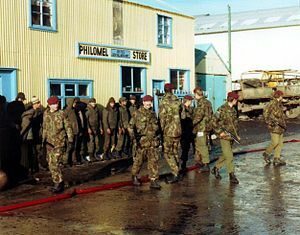 As a result, most of the troops deployed to the Falklands were inexperienced conscripts, and many were from warmer parts of the country, not suited to fighting in the cold and wet Falklands. In 2012, the Argentine Army has 10 Brigades in total – two armoured, three mechanised, three mountain, one paratrooper and one jungle. In particular, a Rapid Deployment Forces is built around the Paratroop Brigade. The Argentine Marines consists of 4 Infantry Battalions with supporting troops. With the addition of dedicated Mountain Brigades, the Argentines could probably provide a better garrison for the Falklands than they did in 1982.Of course, what we do not know is how well trained their troops are – although the Argentine Army does seem to have benefited from increased international co-operation. In addition, friendly relations with the rest of South America means that Argentina would not have to leave units behind to guard her own frontiers. But, as with the British Task Force, the Argentine’s real problem would be getting their troops to the islands in the first place. With one sole amphibious ship, and the tricky prospect of taking Mount Pleasant intact, they might have a bit of trouble actually getting them to the Falklands in the first place. But if a re-run of 1982 was to be experienced, but with modern forces, I would expect a British land force to edge it based on experience and training. Now, in the past I have been among the RAF’s fiercest critics. I am most definitely not anti-air, as I think history has shown that handled properly it can win you wars. But what I am not a fan of is the RAF’s culture when it comes to inter-service rivalries, being something of a self-preservation society. The RAF’s top brass will think nothing of destroying land or sea defence capabilities, if it can salvage something for itself. A ‘junior service’ complex, you might say. And as we have seen with Libya, the RAF’s PR Department is the most active participant in any war. Great if you have wings, but not if you are interested in ‘UK Defence’ overall. But the RAF provides the most potent element of the Falklands Garrison’s tripwire. 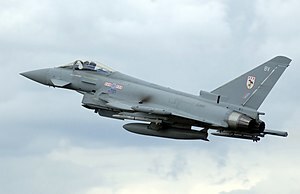 Like Malta during the Second World War, the fate of the Falkland Islands in any future conflict is likely to depend on a handful of aircraft – the four Eurofighter Typhoons based at RAF Mount Pleasant. Of course, I am not privy to defence planning, but I would expect that with such a small flight and obviously a limited number of airframes, we would be doing well to have two of them in the air at any one time. The redeeming factor, however, is the manner in which Argentine air assets have stood still since 1982. Their Air Force and Navy are flying virtually exactly the same aircraft, even to the point of not having replaced their significant losses during the 1982 war. If the Mirages et al struggled against the Sea Harrier, I really wouldn’t fancy their chances againt the Typhoons. The Typhoons, flown by pilots who in all likelihood have recent battle experience (albeit of ground attack), would probably account for a fair few Argentine aircraft. Their job would be to prevent the Argentines landing on the Islands, or at the very least to severely delay them in doing so. The Argentines would probably be looking to land by air, given their lack of amphibious vessels. In order to do so they would need to overwhelm the air defences at Mount Pleasant, and capture the runways intact in order to fly in troops. One would hope – and expect – that RAF Mount Pleasant would have under the runway demolition charges in the event of a capitulation. Compare those numbers to the 70+ aircraft that the Argentines lost in 1982 (total of all types). Then consider how many of them are actually serviceable, how many pilots they actually have, how experienced they are, and what weapons the Argentines actually have available for use. Suddenly it doesn’t seem like such a bad picture after all. With the air bridge from the UK to Mount Pleasant via Ascension, reinforcements could be flown in relatively quickly – one guesses that that is the idea with building an air base on the Islands. It saves on basing large forces there permanently, but enables you to fly in reinforcements quickly. These could include extra Typhoons and Tornados for Air Defence – nominally the RAF has 83 Typhoons and 136 Tornados. There would be a requirement for Globemasters, Tristars and Hercules to set up an air bridge, along with tankers for air-to-air refuelling. A ‘wishlist’ for reinforcing the Falklands at short notice by air would probably look something like this – infantry (battalion size initially), air defence (Fighters and Rapier), transport helicopters and Apaches. Whether we have enough long range transport aircraft to effect such an airbridge, I cannot know. If the islands were lost, then Ascension Island would into play as a vital air hub. Unlike in 1982, the RAF posseses Sentry E3-D. They have a range of around 4,000 nautical miles, so whilst they might not reach the Falklands, they could cover a large part of the South Atlantic. With the demise of Nimrod maritime reconnaisance is a bit of a gap, although the Raytheon Sentinel has a range of some 5,800 miles. Hence early warning and control might be greatly enhanced upon 1982. This should have a knock-on effect for air defence, target acquisition and command and control, in the absence of carrier-borne air cover. With the demise of not only the Sea Harrier but also the Harrier GR’s, any task force would be fighting without its own fixed wing, carrier based aviation. The Sea Harriers were credited with playing a large part in winning the war in 1982. It is frequently assumed that we could not even contemplate another war without carrier-based air cover. Some suggest that the Type 45 Destroyers with their advanced radar and missile systems could effectively provide this cover, but the proof of this pudding is only really in the eating. Who knows how naval exercises have been playing out? One significant improvement on 1982, is the ability to operate Army Air Corps Apaches from onboard ships. I identified how useful this might be in my 2009 series, and their usefulness was shown in the recent Libya conflict. A handful of Apaches on something like HMS Ocean would be incredibly useful, for providing firepower support to ground troops, shooting up bunkers, troop concentrations and the like. I’m not sure how much the concept has been explored, but they could also have an anti-surface role, as US helicopters did during the Iran-Iraq War in the 1980’s. Any task force could expect to face less aircraft than it did in 1982, and certainly nothing which would give it any headaches. With the ratio of force that the Argentine Air Force has to offer, one cannot help but think that just one aircraft carrier with a strike wing of Harriers would do the job nicely. A Twitter follower has rightly pointed out that the Argentine Air Force also possesses a number of A-4AR Fightinghawks, a update of the A-4 Skyhawk using avionics from the F-16 Fighting Falcon. 36 were delivered, but various sources state that only 16 are currently active. Any more information on these numbers would be useful. Before we embark on a look at whether a Falklands War could be fought in 2012, I want to add the caveat that here, we are not merely attempting to fight the last war. The Falklands is just a convenient yardstick for judging a fundamental responsibility of Government, our national ability to defend ourselves and our interests. It is, unless the French invade the Channel Islands any time soon, probably the only case in which Britain might have to act unilateraly on the world stage. What we are doing is assessing change over time, comparing 1982 to 2012. In many ways the world has moved on since 1982, so it would inevitably be a very different conflict, much the same as there is hardly likely to be another Battle of Britain any time in the forseeable future. Any operation at such a distance is inevitably going to be a joint, ‘purple’ operation. In our discussions, I don’t want us to become too centric on any particular Arm or asset. I have no time for single-service narrowmindedness; at some point people need to grow up and consign the spectre of services attempting to out-maneouvre each other to the history books. When armed forces squabble there is only ever one winner – the Treasury. One aspect that I neglected in my 2009 review, was that of politics – both domestic, regional and international. As Clauszwitz said, war is the pursuit of politics through other means, and this is particularly true of international crises that require military intervention. Very rarely in history have wars been fought for wars sake alone; invariably they are motivated by some kind of politics. Witness the 1982 invasion by Argentina. As this broad spectrum of politics would determine if, when and how a war might be fought, and its potential outcome, it seems only sensible to consider these important factors. In 1982 Argentina was ruled by a military junta. Fighting a brutal internal war and locked in territorial disputes with neighbours, the Malvinas provided a suitable release valve for serious internal problems. Ostensibly, much has changed since then. But has it? Argentina is led by a person whose chief virtue is that they are the widow of the last President (Democracy, love it). Not only that, but Christina Fernandez-Kirchner has developed a reputation not only for tasteless flirting at international summits, but also coming out with some inflamatory remarks in recent years. Althought it is tempting to think that whilst Argentina is a democracy military action is unlikely, this underestimates the importance of the Malvinas issue to the Argentine psyche – it has the ability to reduce perfectly sane people into a blithering mess. With the global economy in the situation that it is, and with the potential for social and economic unrest, the Malvina’s option is never going to be completely off the table for Buenos Aires. In 1982 Argentina was pretty much isolated, as military dictatorships invariably tend to be. Locked in territorial disputes with neighbours, she had to retain most of her best troops to stave off a threat from Chile. In 2o12, the scene is quiet different. As a democracy Argentina is very much in from the cold, and recent years have seen something of a South American love in, with characters such as Lula and Chavez supporting Fernandez-Kirchner’s rantings. Whilst much of this is motivated by the popularity of anti-imperialist rhetoric, there have been several cases of latin american countries denying British ships access to facilities, ostensibly at the behest of Buenos Aires. This regional support would extremely unlikely to deter Argentina. Yet, if Argentina were to unexpectedly invade the Falklands, as an agressive act without provocation, we might see support from South American countries fall away. Britain has defence links with Brazil, and whilst Chile and Argentina are getting on a lot better nowadays, again, Britain has strong links with Chile. The Argentines and Uruguayans also have underlying issues. Thus, whilst Argentina might not be as isolated as she was in 1982, an invasion would not win her any allies. The current Government clearly believes that there is no threat in the South Atlantic. When posed questions in Parliament about the possiblity of another Falklands War, the Prime Minister simply replied, in a naive Rumsfeldian manner, that as Argentina is a democracy this would be unthinkable. Putting aside the economic reasoning, the SDSR was, effectively, a 1920’s style 10 year gamble on the part of the Government. That for at least the next ten years, Britain would not have to act on her own militarily, without the aid of allies. Whilst in some respects that is true – invariably Britain acts as part of an alliance, whether it be EU, NATO or otherwise – all the time Britain has interests around the globe, you can never quite discount the need to intervene on your own. Whilst the British Empire is no more – indeed, empires have had their day – there are still Brits around the globe who want to be British, and who deserve our protection. The problem is, that defence cuts rarely deter threats. Quite the opposite. Crises rarely tap you on the shoulder to give you fair warning just before they explode. Even when they do, you cannot always rely on your Foreign Office to deal with them properly (ahem, Carrington). That is exactly what I am trying to get across here- in an uncertain world, the only certain thing is that you can expect the unexpected. Who foresaw the Arab Spring, and Lybia in particular? No one predicted the fall of the Berlin Wall in 1989. And what about the first Gulf War? The moral is very much that you cannot plan for international crises, but you can at least try to put yourself in a position to respond to most scenarios as best you can. Any Government faced with an invasion of British territory – or any other gross affront to British interests – would be hard pressed to survive. The British public might not be quite the flag waving rabble of Charles and Di’s wedding, but I doubt very much whether any administration surrendering the Falklands would survive. Given the support for the armed forces in recent years, any pictures of being made to lie prostate on the ground would provoke outrage. In 1982 Thatcher was able to turn things around by hook and crook, but whether that would be possible in 2012 is another matter. In 1982 the issue was very clear – the inhabitants of the Falkland Islands were British, and wanted to remain British. In that sense, Britain was acting to defend their rights of self-determination, to live under the sovereignty of their choosing. Virtually all of the Falkland Islanders are of British descent, and whilst there are allegations of Imperialism, in many cases Falklands families have been living there longer than Spanish-descended Argentines have been living in South America. Any Government abandoning the Falkland Islanders to Argentina against their will could expect to be relegated to the opposition benches pretty sharpish, particularly given the place that the Falklands holds in British culture after 1982. The issue of citizenship, sovereignty and self-determination still remains, yet since 2009 a huge new issue has arisen – that of black gold. Huge fossil fuel reserves have been discovered in the South Atlantic off the Falkland Islands, and ownership of the territorial waters brings with it the right to explore for gas and oil. It might be a coincidence, but Argentine bluff and bluster since the discovery has increased considerably. Lucrative natural resources have had the ability to cause war more than any other factor in the past 25 or so years. And with the global economy in the doldrums, any means of making money is going to be sought after. Any businesses looking to drill for oil in the South Atlantic will exert considerable lobbying pressure on the UK Government, and indeed on other Governments. The Government might also be more inclined to act to support oil companies, more than it would for a few thousands kelpers. The same goes for fishing rights, albeit on not such a money-spinning level. The policy of the United Nations – Security Council and General Assembly – has been unequivocal in its policy on the Falklands – Britain and Argentina should resume negotiations towards a peaceful settlement. Quite how these negotations should come about, what should be negotiated and what a peaceful settlement would comprise, has never been elaborated. Thus the UN, sadly as usual, is as intransigent as it could possibly be. Any un-mitigated invasion of the Falklands would no doubt be brought before the Security Council. Of the 5 permanent members, the UK would of course vote for action, the US and France would probably be swayed towards the British cause, however China may prove more difficult. And with the current frosty state of relations between Britain and Russia, help from that direction can probably be discounted. The chance of any resolution going through without a veto from one of the permanent 5 members seems unlikely. When we consider the rest of the membership, it is also unlikely that all of them would vote for Britain – anti-colonialism is hot political currency these days, and the non-aligned movement has gained influence in the past few years. As a key member of the EU and NATO, Britain could in theory call on support from these quarters. However, as in 1982, I would find it hard to believe that France would lend us Charles de Gaulle, or that the US would provide AWACS for us. The best we could probably hope for is sanctions to be placed on Argentina, covert assistance with supplies and basing, and help in covering for our standing patrols, such as in the Gulf or off the horn of Africa, in order to free up slack for a Task Force. We might find ourselves in need of more Tomahawks at some point, in which case we would have to go cap in hand to the US.